Owning a home theater system is a dream for many homeowners, but it doesn’t have to stay a dream forever. Custom Cinema and Sound has been installing unique home theater systems for more than a decade, and they’re here with a quick guide to help you get started on the perfect home theater. 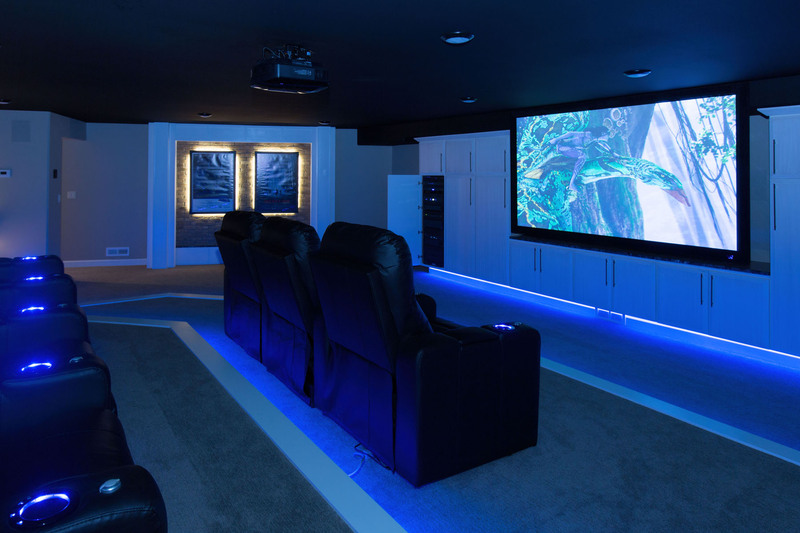 Read the tips and guidance below to learn everything you need for a reliable, high-end home theater. A common mistake people make is picking out their theater screen or 4K UHD TV before really thinking about which size and shape will be the best fit for the room. If you’re having your home theater professionally installed, the contractor will create engineering plans of the room that include the height, width, and depth of the room, as well as the location of windows and doors. These plans are used to decide how many seats can fit comfortably in the room, the ideal spacing between seats and screen, locations of speakers, etc. Some of the best home theaters around the world have unique themes based on movies, books, locations, etc. If you want to theme your theater, pick out something that’s important to you and incorporate it into every aspect of the space, from the wall sconces to the ceiling color. This is an optional step to a degree, but the idea is to know exactly what kind of vibe you want for the room right from the beginning. This will affect the type of seating you choose, the décor, the lighting, and even the A/V equipment, so before you start picking out your screen or theater curtains, try to get a clear idea of what you want for the space. Screen: If there is a lot of ambient light in your theater space, choose a high-contrast screen in a dark gray or black color. And if you’re hiding speakers behind the screen, be sure to pick a screen material that is acoustically transparent so that the speaker quality isn’t muffled. Projector: While many 4K UHD TVs rival traditional projectors for high-quality visuals, a projector still gives that traditional cinema vibe. Make sure you get a liquid-cooled projector that operates quietly and also has the appropriate capabilities for your screen size. Speakers: The quality of your speakers will make or break the cinematic experience in your home theater. Don’t skimp by choosing off-the-shelf speakers that create subpar audio; instead, invest in surround sound speakers that can be placed strategically throughout the room for truly exceptional audio. Control System: To get the same level of relaxation and ease that you would have in a regular theater, integrate all of the theater elements into one control system that allows you to lower the lights, select the movie, turn on the projector, and start your show with the push of a button. Once all of the plans and equipment have been decided on, it’s time to implement. Depending on the current state of the room and the scope of your goals for your theater, this phase may not take very long at all. However, there are a few considerations you should keep in mind. The first is hidden media. Especially if you want to use the room for more than just a home theater, it’s important to install the equipment so that it can be hidden out of sight. Even for dedicated home theaters, hiding away the equipment and cords keeps your home theater design clean and clutter-free. Your contractor can design integrated cabinets to hold the equipment and even completely hide speakers within the walls and ceilings and behind the projector screen without compromising audio quality at all. The other thing to consider is the networking requirements for your home theater. 4K UHD streaming takes a lot of bandwidth, so if you want to enjoy your movie or show to the full extent, you need to optimize your network to support the increased load. Your home theater contractor can analyze the wiring in the room and your current home networking solution to make sure that it’s ready to handle 4K streaming. Once the equipment is in place, the project isn’t finished yet. The system needs to be optimized so that you get full performance and enjoyment from the screen, projector, speakers, lighting, etc. During this phase, your home theater contractor will carefully test the room acoustics to ensure there are no dead spots, try out the control system to verify user-friendliness, and make sure that the projector is properly set to give the best picture clarity on the screen. A lot of thought and planning goes into a home theater system, but the final result is well worth it. To explore the options for a theater in your Moorhead or Fargo home, contact Custom Cinema and Sound today.